Trying to dodge a looming rainstorm the Saturday6 team hurriedly chugged up the steep hill to The Lodge. We had spent most of the afternoon inside the MTD headquarter's building learning from the gracious employee team and engineers about their products and their standard of business practices. What stood out to me the most that May day in Cleveland, Ohio was hearing the history of MTD products and its owners. MTD is a worldwide leader of outdoor power equipment that has built the family-owned business on values like stewardship, integrity, and hard work. I like that. 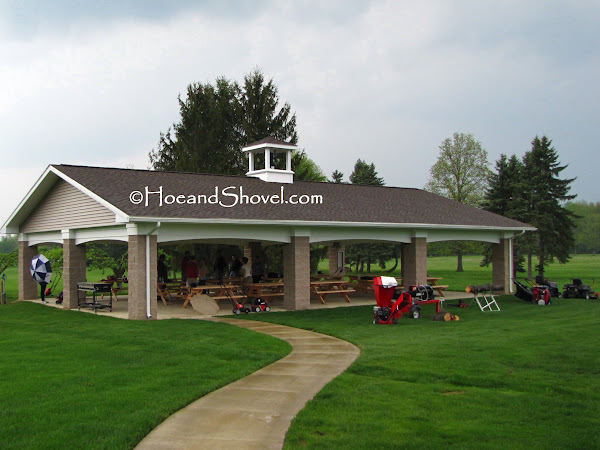 The covered pavilion adjacent to The Lodge was set up with various home lawn equipment that we were all invited to play with, errr ... I mean test-out to our hearts' content. My thought was to try what I knew I would use back at home. 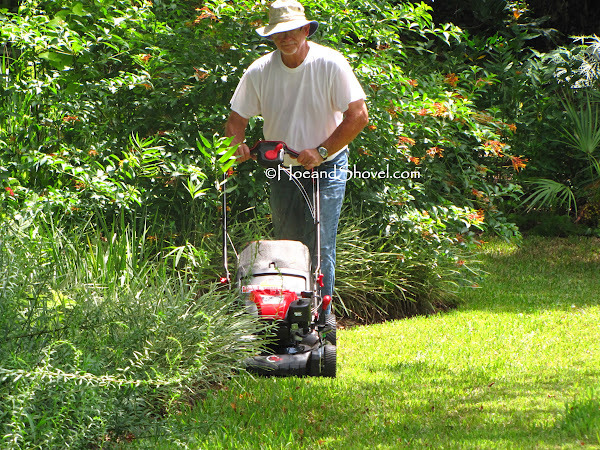 A hand held weed trimmer was on my mind to help me keep all the asiatic jasmine in check. That was fun. Have I ever mentioned how much I like power tools? Then I saw this beauty. 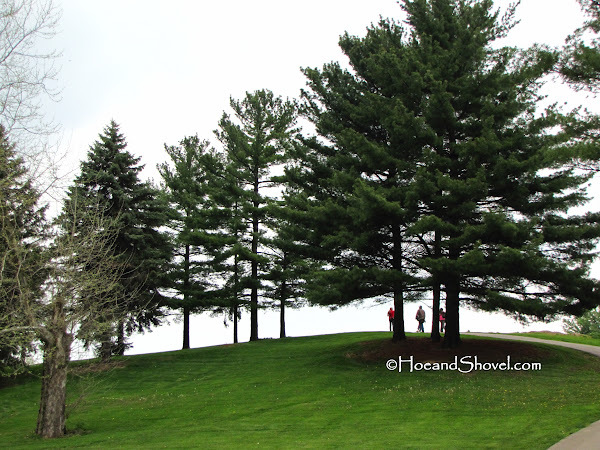 Oh, it rained on me while I mowed the green, green grass of that Ohio hill. But somehow I managed not to melt away. And that's the story of how I came to be the owner of my very own powerful and efficient TB350 XP Troy-Bilt mower. It arrived to Hoe and Shovel in a box. Keep reading and you'll find out how you can enter to win one for yourself. Now that's exciting! Mr. Meems assembled it with just a few handy tools and ... look at that... he's reading the instructions. Honestly, I don't know what he used because I was busy unloading bales of pine straw out of my truck and keeping up with a 5yo. But I know it didn't take him long. And then he was on his way getting the job done. He's so cute when he mows! He likes 'my' mower. As much lawn as I've removed over the years a nice patch of it remains in the back yard for the family to play. And, oh my, does that St. Augustine grass grow like a weed in the summertime! It makes me think of a carpet of green on mowing day. (I took these photos in August). A nice spread of lawn is soothing to the eyes don't you think! And just for you... a personal demonstration of the good work this machine can do. And now for the exciting part. 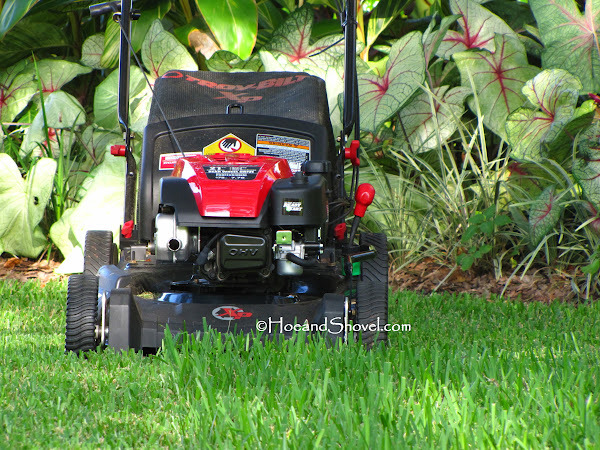 You can enter to **win a mower just like mine! 1. 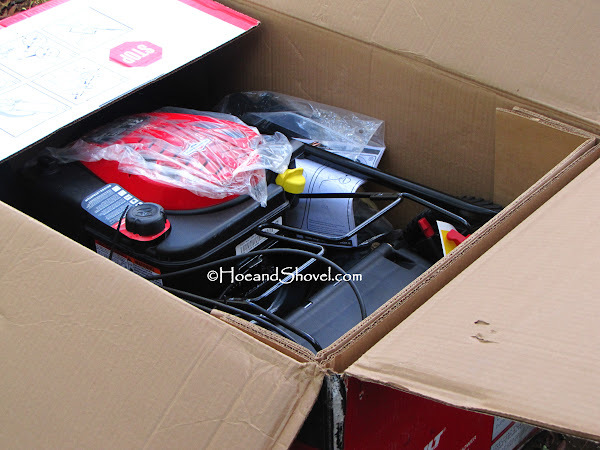 To enter the giveaway, just leave a comment in the *comments* section of this post telling me something about your lawn and why you'd like a new mower. Each contestant must have a street address (no P.O. Boxes) in the continuous 48 states. Winner will be announced November 30! Have fun and good luck, dear Readers. ** Troy-Bilt provided this product as part of my membership. 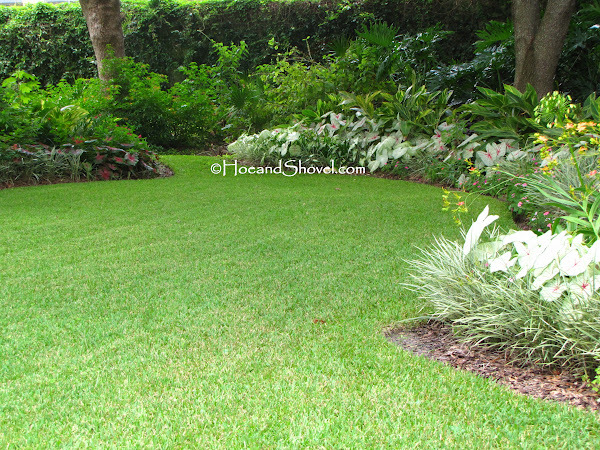 I'm not sure how you keep your St. Augustine grass looking so good in the heat of August! As you well know, we are not fans of turf, but it would be nice to be able to give the Mister a new mower since we must maintain what we've got. Now that looks like a really nice lawnmower. We have some awful grass too that is tough to mow. My old lawnmower is old, but still works. It would be great to win this beautiful workhorse. I enjoy mowing, have since I was a teen. There is just something very satisfying in the process and in seeing the finished results. I used to have one of these but ran it into the ground. My lawn is centipede and not hard to mow but my back needs self propelled these days. My flower gardens and lawn are my are my world that takes me away into my own private sanctuary. I am retired and on a very fixed income with disabilities. A new mower would make it so much easier and allow more time for enjoyment of my garden. I have no one to mow and no funds for a new mower. But I will never give up my gardening as long as I'm able to stand. At the present I mow a little, break for oxygen and then on to mow another couple of lines. It is my salvation. All my troubles seem so small when I am in my garden taking care of it! My lawn is a play haven for our house full of 5 little ones from 1yo thru 10 with every game you can imagine from soccer to tag. So in that we always have to keep it mowed really nice. And that also brings out one of my favorite smells...fresh cut grass, gotta love it, such a reminder of summer. A new mower would be a great way to let the hubby know we appreciate him keeping this up and it would give him a much better tool to do it with than the one he stuggles with now. Nice mower. We have an acre in Central Florida with 3 separate areas of flower beds and 2 large KOI/water gardens which keep me busy. I just recently retired and spend most of my time outside in my "little piece of heaven". I would love to surprise my husband with a freshly mowed lawn every week during the mowing season. However, he won't let me use the riding mower. He still is working and this would give us some extra together time on the weekends, plus it would be great exercise for me. 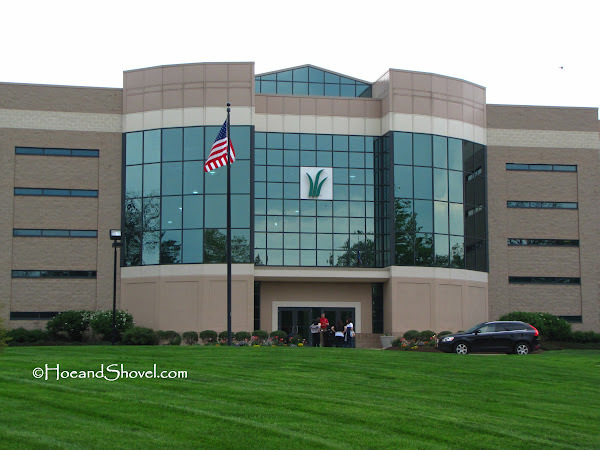 Thanks for the chance at the mower and for your great site. I've only used organics on the lawn for the past 2-3 years and I water less often than I used to. Just keep it mowed regularly and besides a freshly mowed lawn always looks good no matter the condition right? Mr. Meems actually has taken over the mowing and edging most of the time but I really enjoy that job. I've given it up to him with so many more 'jobs' that need my attention. Good luck. Hi Meems....I would love a new lawn mower! Lots of weeds in my lawn but they are green and that is all that matters to me! Troybilt has always made the best equipment. Their mowers last forever. That is so good to count on today. What a great giveaway and good luck to a lucky winner. Love that it is a mulching model, that is a must for me. I've read that you can skip a round of fertilizing the grass when you turn back the cuttings. Nice loking machine just wanted to say good luck for the giveaway. I would love a new push mower! We've had ours for about 12 years now and although she still runs, we've made a few modifications just to be able to crank it up. BTW - I love to mow, but the husband doesn't think I should now that it's unsafe. But if we don't win... at least we have your awesome blog to turn to for advice!! How fortunate you are to have that "job" of testing products! Wish I were so lucky! I have a small yard of Saint Augustine which has been cut by a lawn guy because he charges so little, but prices have increased as of late... Sure would be nice to cut it myself and shed a few pounds in the process! Meems would be an awesome gift for my husband as our lawnmower died on us recently. My two kids love to play outside every chance they get. They play all kinds of stuff on our lawn soccer, kick ball..etc. Hubby hurt his back and this would be much easier for him to use. Thank you so much for the contest. Hi Meems.....What a great lawn mower!! Your patch of lawn is beautiful. I could use a lawn mower like that...especially in the back yard where there is a very steep slope down to the little stream. It is a real hassle mowing that area. I've been in San Diego for almost 2 weeks: son's wedding and visiting with all 3 of my kids and all the grandkids. It's been great, but it will sure be good to get home to Florida! Oooo, how exciting! Our mower died this summer. 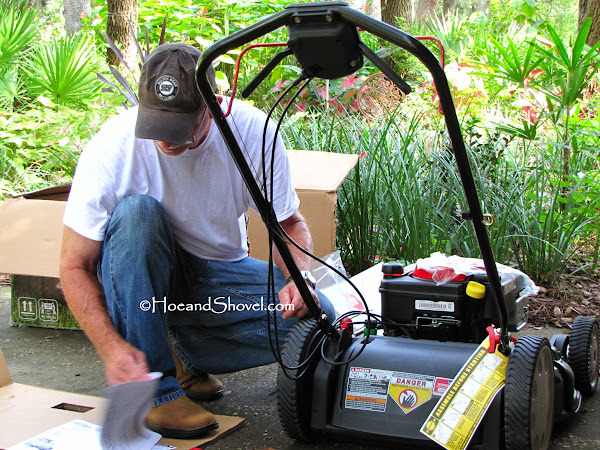 How cool would it be to win this awesome mower?!? Thanks for the opportunity! You rock, Meems! You looked like too much fun was had with your new little toy! Fun times in Florida!!! We have a 1.5 acre yard full of weeds. And a old half broken 30+ yr old push mower to cut it with! To win this would be FABULOUS! Our daughter loves to play outside, but the grass, excuse me- weeds, grow so fast, our poor mower struggles to keep up. It breaks every other week. The age of the mower is making is making it harder and harder to find parts. I noticed in some of your older photos that your plumbago got quite tall. How did you train them to grow so high? Mine want to sprawl all over the place and I would like some height out of them. I would love for mine to look like yours. I rarely trim plumbago off the top... only soft prune any crossing branches that seem to weigh down the others. I do however, trim up the bottom a couple of times a year. The tall ones you refer to (I think)are planted behind a built up retaining wall at the back side of the tropical garden. They are raised about 2 feet to begin with... there is another row of them further back. In my opinion they look best when the top braches can be left sort of free-form. It's good to hear from you... do you want to be entered in the contest for the mower? I loved our small back lawn in FL! It was like yours. I had to leave some for the family. :) in VA, we have hills and my lawn mower likes to rebel and not crank a lot. The neatest thing is that there is a huge patch of wild strawberries under the apple trees...they grow fast and when I mow them, it looks like green velvet carpet. Chance rolls in it when it's fresh cut, and then thousands of tiny grasshoppers come out. I haven't noticed them eating plants, but I have noticed several birds having a feast on them. We moved into our house in 2009 and we still don't have a mower of our own. We borrow my parents, which involves a trip to their house, loading up a truck and driving it here and loading it back up and taking it back. With a new little one born in August, I am not sure when a mower would make it our way. Our yard's not much to look at, but I read this blog and dream about what I could do with it in my "free time". Being able to mow it whenever I want would be a first step. I have enjoyed your blog for several years now, beginning with "The Peacock Chronicles." I've always wanted peacocks of my own and fortunately, have the land to do it. However, after reading about your experiences, my better judgement decided against it...who knew they were so destructive?!?!! That aside, I am also a Central Florida resident and have been for my entire life, short as it may be. I have also been an avid gardener and a big passion of mine is and has always been growing Florida friendly plants. Imagine my joy when I came across your blog! I am, however, guilty of tending to a relatively large rose garden, but being that it is made up mainly of heirloom and easy care roses, I don't feel too guilty about having it. Strangely enough, I have never had a patch of lawn! I live in an orange grove. When we built our house, we cleared just enough space to build our home and plant our fruit trees, vegetable garden, roses, and laid our driveway. The rest has been wild lawn which pretty much consists of weeds that we keep mowed with the tractor during the warm months. I've finally gotten so tired of seeing nothing but weeds and not having a surface to play croquet on, that I deided to bite the bullet and plant a new lawn/garden in the front yard. It's a tiny rectangular patch of Zoysia, but I'm in love. I have no plans to spread any further though; sometimes, even the best love affairs have boundaries and limits! I've drawn the line at a rectangle just large enough to enjoy at 50 x 100 feet. :) All that aside, Zoysia, as you know, slow growing and low maintenance as it is, still needs to be mowed every so often. Well, it's only recently dawned on me that I don't have a proper lawn mower to mow it with! When I saw your contest, I said "I HAVE TO ENTER THAT!" And here I am, excited and hopeful that I may be the lucky new owner of a terrific new TroyBilt mower to help me keep my terrific new Zoysia lawn well-mowed and looking beautifully (fingers crossed)!!! Thanks for the explanation about your plumbago. This is the first year for mine, so I'm going to try your technique and see if mine will stack more next year. Like everything you touch, yours are gorgeous! Yes, thank you! I would love to be entered into the contest! That mower is sweeeeeeeeeeeeeeet!!! My lawn is mostly pasture, but there are still enough small areas that could benefit from a smaller mower that I could push. Unlike husband's big rider that I am not allowed to touch. I read your blog regularly, but don't comment much. A giveaway lured me from lurking. Does Mr. Meems hire out in the summer time? We have about nine acres of grass that won't quit.